Dontcha just hate it when people take perfectly good cars/trucks and cover them in gaudy paint, questionable aftermarket chrome, and corny graphics? Yeah, me too...wait...who did what? You say this was done by the factory? In that case, honey, cash out our 401k, this thing is awesome. 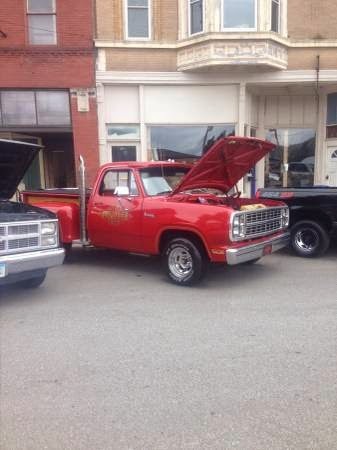 Find this 1979 Dodge Lil' Red Express Truck offered for $7,500 in Clarinda, IA via craigslist. Tip from Andy L.
The 360 cubic inch LA V8 was rated at 225 SAE net horsepower (this would be equivalent to a 300ish rating from a pre-1973 SAE gross rating) at 3800 rpm and 295 ft-lbs of torque. The Lil Red Express added a 727 Loadflight automatic transmission and a 3.55:1 rear axle for a great launch and decent top end performance. The dual exhaust with vertical stack-pipes and assorted accoutrements add up to a feast for the 70s fanatic. A quick search for other Lil' Red Expressions for sale finds some nutter who has amassed a collection of six of these things (out of the 7,000 produced). 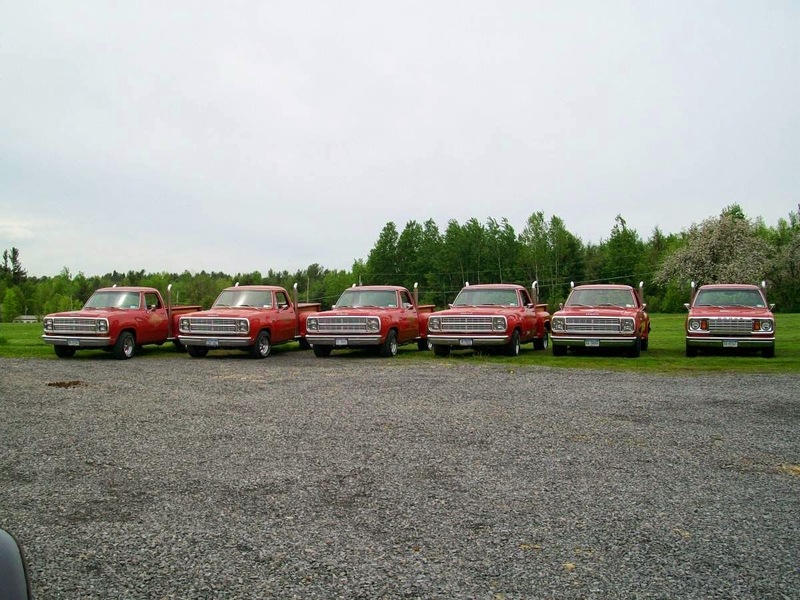 Find the half dozen here on hemmings offered for an undisclosed price. If you're going to discuss the LRE, then you've GOT to talk about the Warlock! Here's a 1978 for $28,900. If I knew about the Warlock I'd forgotten. So thanks for the reminder, or introduction, whatever it may be. From an aesthetic standpoint alone I like the Warlock better than the LRE. You're very welcome! The Warlock has been pretty well forgotten at this point, yet it's more rare and arguably more desirable, in a quieter way. One of the cars (truck) I want to own before I die. I remember going to the Dodge car lot with my dad when I was a kid and being totally blown away! yep, as a 7 year old wayyy back in the day, when I saw one of these on the road I would lose my freaking mind. This baby is an awesome product of the Smokey and the Bandit/BJ and the Bear/CB radio culture heyday. I would love to take my wife out to dinner with valet parking in this. Maybe install some air horns as well to announce our arrival at a local gala. I'm thinking more Econoline with the bubble-window in the side, shag carpet and the N50-15 rear tires on chrome Cragars. No need. There's already a pair mounted. Now if they're functional, your awesomeness meter will be pegged. Yeah, it's pretty much as anti-everything-cars-have-become as you can get short of something like a Model A, and probably a decent drive as a cruiser. I vaguely remember some kind of Motor Trend top-speed test from the Early Middle Ages somewhere around the Ford Administration. If memory serves they got this thing up to just short of 120, and the 'Vette with less frontal area got to - 130? All the wheezy ponycars of the day were pretty laughable, four-speed boxes and mud-bogger gearing, spinning right up to valve-float to get to what today wouldn't catch a Kia Rio. Your memory matches mine----this truck was pretty much Dodge's middle finger to the govt regulations that strangled malaise era automobiles. Because it was a truck, it could leave off all those power-sapping accoutrements and have some semblance of performance. the time from the LA 360 was pretty quick and torky. Sure was a crowd pleaser lot's of thumbs up. Raced a few times ran 15.40's in the 1/4 mile The 1978 is rarer only because there numbers are about half of the 79 production i prefer the 79 Look with the stacked headlights 78 has single round lights.